If you’re new to the embroidery / quilting / needlecrafting world, you might think I’m a little off my nut here. But if you’ve been in the game for a while and you’ve had contact with other people in the hand crafting and needle arts world, then you’re probably familiar with the term UFO, and you know what I mean by it. A UFO – strangely enough – is an UnFinished Object. This particular moniker has always irritated me a little bit. Why do we call it a UFO? Firstly, unfinished is one word. So, if anything, it should be a UO. But I realize that sounds equally silly. Secondly, who calls their embroidery work an object, anyway? I generally call it an embroidery project. If I don’t finish it, it’s an Unfinished Project. And I’ve had plenty of UPs in my life! Today, I want to chat a bit about UPs. It’s a subject that preys on my mind, because I hear so many people mentioning their unfinished embroidery projects, their guilt associated with them, and their inability to go forward because of them. I think we need to come to grips with what an unfinished project is, why we have them, and what we can do about them. I’ll offer my conclusion first, so you know where I’m going. I’m arguing (in the proper sense of the term) in support of the UP – of the UFO – of the Unfinished Project. I believe that it is normal and it is OK to have unfinished projects. And I mean truly unfinished projects that you will never, ever go back to and finish. First, let’s discuss why we embroider. Embroidery and other forms of needlework, for most people, are leisure activities. Most of us embroider because it supplies us with a certain level of pleasure. Embroidery may be a hobby or pastime, or it may be our living, but we do it because we enjoy it. Why we end up with unfinished projects will differ from person to person, based on life circumstances, temperament and personality, and many other factors unique only to the individual. Disruptions in Life is an obvious reason why a needlework project may never get finished. And disruptions can very easily lead to some of the other reasons on the list. You know how it is: your life takes a turn – you end up in some kind of circumstance where you can’t devote time and energy to a needlework project. Time goes by, and when you can return to the project, you find that your interests have changed, or the project bores you, or your tastes (in style, colors, whatever) have shifted. Boredom doesn’t need too much qualification. You started a project that you were initially enthusiastic about, and it turned out to be a boring project. That happens. It is pretty much normal for people to develop new interests as they grow and as they learn more. Imagine a crafty person discovering, for the first time, the needle arts. Imagine that this discovery was in the form of plastic canvas. Having not grown up around needlework, she didn’t know anything about it, but, being intrigued by a kit at a big box craft store, she bought it, and she made the thing. She loved it! It was so much fun to make that little plastic canvas doohickey! So she goes to the big box store and buys three more kits. And halfway through the second kit, she has an epiphany. You see, she loves all things NYC, and the Empire State Building is an object of utter fascination and obsession with her. She wants to stitch and build the Empire State Building in plastic canvas! So she ditches Kit 2, and starts out on a quest to discover how she can go about doing this. She enters. She sees painted canvases hanging everywhere, bright and colorful, fantastically artistic. And she sees the walls and the racks full of all kinds of luxurious threads and colors and wonderful fibery skeins. Oh, what marvels to behold! She strikes up a chat with the shopkeeper. And the shopkeeper shows her a beautifully painted needlepoint canvas featuring the Empire State Building. And suddenly, the plastic canvas architectural dream has fizzled, and the new needlepoint addict is born. That’s a normal shift of interest. Life got in the way (see #1) as soon as you graduated from high school in 1987, so you set aside that counted cross stitch sampler you were working on. It’s 2014 and you really want to take up stitching, but you’ve got that counted cross stitch project you started in 1987 hanging over your head. You riffle through your storage boxes and find it. You take it out. Suddenly, all those high school memories from the 80’s start flooding in. Your hair suddenly feels remarkably big. And your Hightops and your earrings, remarkably heavy. Your barrettes have ribbons and things dangling from them, your eyeshadow just turned bright blue and pink, and oh, that headband! And…and… is that Air Supply trying to break through your subconsciousness? Nooooooooooooo…..! The only reasonable thing to do is stuff that project back in its box. Yes, I’m exaggerating. But tastes do change. And if life gets in the way and you can’t get back to a project for years, it isn’t unlikely that your tastes will have changed by the time you can. Oh my goodness! So-n-So is going to be in the US teaching at various EGA groups this year. I really want to take a class with her. I really want to learn that particular technique. But gosh, I don’t really like the project she’s teaching. Still, it’s the technique I want to learn. And I know I’ll benefit from her class. So I take the class. I learned the technique. I learned a ton in the class and really enjoyed it. I got everything I wanted out of the class – in short, it was worth it. But wow, I really don’t like the design and project that we used in the class. It just isn’t my style. I’m not going to finish it. Why Must We Finish It? You can argue that it is a waste of materials and a waste of time not to finish a project that you started. But the fact is, you already spent the money, and the money is gone. You put time into it already, and that time is gone. Finishing the project at this point – if it is truly something that no longer gives you pleasure and that inhibits you from moving on, improving, and growing – is not going to bring back your money or your time already spent. If the project is not going to afford you the pleasure that leisure projects and hobbies are supposed to afford you, why waste any more of your time on it? If you are bored with it and it’s torture to continue it, why waste your time on it? If you are no longer interested in the type of needlework, why waste your time on it? If you hate the colors, if the style is totally out of fashion for your current tastes, if the idea of displaying the finished piece in your home makes you cringe, why waste your time on it? If you have learned what you wanted to learn – if you have gotten out of the project what you wanted to get out of the project – and you don’t care to finish the project, why waste your time on it? But this doesn’t mean you waste the project! Don’t pitch it. Don’t shove it in a box to store indefinitely. If you know you are never going to do it, and yet it is hanging over your head and inhibiting you from moving on, then move it on, instead. You’d be surprised how many people out there are interested in your half-stitched project! Package up all the supplies and instructions neatly in a clear plastic bag (preferably the original packaging), with the cover or finished picture facing outwards, write a note and insert it in the project bag that says “partially completed,” and take the project to a local charity shop, op shop, thrift store. Or take it to a local guild to see if any stitchers you know are keen to work it. Or, if it’s a particularly well-known designer or was a particularly expensive project, put it on eBay and sell it. Just make sure folks know it’s partially completed. This way, you ensure the materials don’t go to waste, you remove the cloud hanging over your head, and you keep your storage space for your needlework and hobbies free of stagnated projects. I’m not advocating a wasteful approach to hobbies. I believe that hobbies are a great way to learn perseverance, to develop and hone skills, to learn to see things through to the finish. The finish is where the real satisfaction and the real pleasure comes, after all. But I am advocating a balanced approach, because sometimes, there are projects that you just won’t finish. Might as well face it and move on! Reasonably assess the unfinished project that’s hanging over your head to see if you actually do care enough about it to finish it. If it’s not affording you pleasure, if it’s holding you back from growing your interests in another direction, and if, deep down, you know you will never finish it (and you have no desire to), then face the fact, and move on. Package it up and hand it off somehow. If there’s a chance that your interest will renew – if you want your interest in it to renew – then consider it a Work in Progress, bag it up, and put it away for a while. Move on to other projects. But don’t feel guilty about it! Don’t let it hold you back from doing something else. Some day, if you really want to work it, your interest will rekindle. Every several months – maybe twice a year – take it out and look at it carefully. If it doesn’t spark your interest, but you still like it, package it back up and put it away. Eventually, it’ll either spark your interest, or you will look at it and know that it’s over. At that point, pass it on. What’s your approach to unfinished projects? Do you have any thoughts, insights, or advice to share? Feel free to join in the discussion below! I have a lot of unfinished projects. A few are cross stitch. Every so often, I pull one out, add a few stitches, realize I’m still not fond of regular cross stitch, and put it away. Unfinished crochet projects, usually from trying a new pattern and realizing I just don’t like it. Quite a few unfinished embroidery projects. Those I consider WIPs though, because I do plan to finish them. I just have this teeny tiny problem of my brain runs 1,000 mph and needs constant action, so I can’t just sit and stitch mindlessly. If I can get to the relaxed mindless stage, I fall asleep lol. But normally my brain is constantly going and I can’t fall asleep. Luckily I can usually focus on what I am currently doing while I’m also thinking of the next thing, such as a new embroidery design or new quilt design. I have notebooks all over the house where I can jot down ideas while I’m doing something. I don’t have many UFO’s or UP’s I do have some UP’s that I bought and didn’t start because on reflection I lost interest in them. I do have a few completed projects unframed and in plastic bags waiting for a decision on what to do with them and some eggs waiting to be embroidered. It’s nice to know that UFO’s/UP’s aren’t a bad thing and I like all your answers on why it’s fine to have UFO’s/UP’s which make a lot of sense and they are perfectly logical reasons for uncompleted projects. Thanks for your support in favour of UP/UFO’s and for the great article and for sharing your views on this subject with us. My craft room has so many UFOs that we call it Area 51. Best laugh I’ve had all day! Looks like I’ll be renaming my craft room. Oh my gosh, that is so great! I loved this….they hang around and make me feel guilty! But packaging them up and giving them away makes me feel generous and no longer burdened! UFO stands for Unfinished Object. UFO also stands for Unidentified Flying Object. I have several UFOs. Both in needlework and in sewing. I feel no guilt about my embroidered UFOs. I quit them because I got bored. And if I just kept trying to force myself to finish projects that I’d grown to hate because I got so bored with them, I’d might hate embroidering by the time I was done! Like you said, If you are bored with it and it’s torture to continue it, why waste your time on it? That being said, I do feel a little guilt about my sewing UFOs. I sew clothing for myself and I sew crafty things. I have a skirt that turned out to be too short, and I haven’t lengthened it and hemmed it. I have a shirt that I still haven’t installed the zipper in because it will be a size too small when I finish it. I have numerous hairbows that are still just finished rectangles of fabric. But I still PLAN on finishing them, so I guess really they are WIPs. I call mine WISP’s – Work In Slow Progress, makes them sound more interesting. I also feel I sometimes need to change pace, and texture to make life more interesting too! Some days are ‘flower’ days, some ‘insect’ days, and some just not doing anything days!! I like the name WISPs! I have lots. I’d never thought of moving partially stitched projects on. If I’ve become certain I won’t complete I generally repurpose the materials. Good idea Mary. Lovely! My thoughts exactly! WISPs rule! Got you beat! I still have one from 1968. Guess I should finally give up on it. That’s a great way to put it: Work in Slow Progress. I like that! Great blog on UFOs/UPs. Lately, the “Let it Go” song plays in my head when I look at mine. I can totally relate the big hair flash back as that is the era I stated my needlework journey. Thank you for today’s Newsletter. For the first time in a lot of years I don’t feel guilty about the UFOs lingering in the numerous drawers in the sewing room. I completely agree with your comments but would add one more reason projects are unfinished. It’s because of errors. You get so frustrated when you work so hard on a project and find you need to tear out a large area. So you put it aside to work on something else and never get back to it. I can totally relate to this. I have done a LOT of needlework in the past 50+ years, (and also have my fair share of UFOs) but when I make a mistake, and have to pull the work back – which I hate even more than mending – I give it 2 chances, then stall. I cannot bring myself to throw it away, and I don’t think it can really go to the charity shop, perhaps I should re-purpose, as Irene in NZ suggests? I too believe in UFO’s. I have them in my embroidery projects, knitting projects and quilting projects. I can think of as many reason why I put them to the side. I agree with some of your observations of “why” We fiber artist just create UFO’s, this is another thing we just do. There are projects I return to and the others, I just hide from my better half, so he won’t complain that I am wasting money. I have to agree, something of the projects are expensive. The quilting guild I below have an UFO exchange table set-up. If there is something that you have won’t be returning too it goes on the UFO exchange table. Sometimes I see on the UFO table a project I would like to try. All finish projects are donated to charity. Great advice. I have 3 UFOs and one is the first project I ever worked. I now have permission to package them up and pass them on! Thanks! i don’t care for counted cross stitch over much, but found a alphabet sampler that I couldn’t live without. I have gutted my way through all of it except the rose border that encircles it. I still want it so much and as I put in a few stitches here and there, I daydream of someone swooping in and finishing it, so I can frame it and look at it. It sits right in front of me hanging over a sit upon reproachfully giving me the eye. ITS JUST THE BORDER, I tell myself every day. Still and all, I want it done. Thanks for listening everyone. It seems that your dream can become a reality. I remember when Mary finished her small cross stitch project using the fifteen minutes at a time. It was so interesting to see how much can be accomplished in fifteen minutes a day. Oh, my goodness, it’s all so true. I hate to give up on a project, but some of them I probably should. …and just so people know, I recently did buy three unfinished needlepoint projects at a local church sale, because I’m interested in the stitches and teachers. Seem to be fully kitted, and include threads that are no longer available. Would have been worth the low price just for the stretcher bars. Now to work those into the ‘rotation’. Thank you so much for this issue on your website.I’ve been stitching for over 40 years now. I have so many unfinished projects. Probably over 100. You have given me the encourgement to go through them and package those up that I know I’ll never stitch. After reading your article, I won’t feel bad about taking them to a local thrift shop. Thank you so much. You have lifted the guilt off my shoulders!!! I do have a lot of works in progress but it’s fine because I know I will finish them. I have given up on some and packaged them off to the thrift store. The main reason that I have so many is the lack of time, still work full time and I don’t have a dedicated room/space where I can leave things out and when I have some free time I could just go and sit and work at them. Oh well retirement is only 4.5 years away. Enjoyed the article very much! Oh, yeah, I know of UPs and hobbies that no longer interest me. I have lots of rubber stamps that I’ve started giving away. I have a number of embroidery projects waiting to find a home. But, that’s OK and I don’t feel the least bit guilty. Thanks for the affirmation! And for your great site. I look forward to it every morning. Wonderful topic and very well put. Thank you, Mary. I have a bright new attitude now. In your words, I find the support that allows me to maintain self-esteem and develop further. Success in work and my best wishes! One fine day, I realized – for the reasons you listed – I needed to GIVE MYSELF PERMISSION not to finish a project! Quilting or making photo albums or other once attractive projects were re-evaluated and the enjoyable UFOs were either WIPs or even finished! Very freeing! Permission granted. I’ve set aside projects for all of the above reasons. Sometimes I get them out years later and complete them, sometimes they evolve into something new, sometimes I cannibalize the supplies (which I guess is sort of evolution), and sometimes, with some sadness and guilt at the waste, I pass them on. Interests change, tastes change, and, sadly, physical abilities change – there are things my hands just won’t do any more. I still call them UFOs, though. I’m a geeky old SF fan, and it amuses me. Mary, cute post about us stitchers! I think that we embroidery because we have a desire to create. AND, we have a desire to create something beautiful. Last week I found a portion of harvest green fringe that I had used on a crazy quilt tablecloth that I had made for my mother in 1970!! Guess what–the tablecloth is currently on my kitchen table under a piece of glass! I guess I love vintage because I AM VINTAGE!! Thanks for all your creativity and love, Mary! I think often projects are set aside when there is a problem. Maybe a major problem, maybe a small problem. I remember once pulling out a long untouched quilt project. Seems I had problems with getting the border on. I only had to put on two borders and miter the corners and the top was finished! However, it took me about 15 minutes to solve the problem that had stopped me. I must have put it aside, wandered off and in the meantime started two more projects. I am trying to evaluate projects this year. If I think I learned what I set out to learn and I don’t want to finish the project, I am considering giving it away. I have given away two projects this year! However, I still have about a zillion to check on and decide about. Two is good, though! Yes, I forgot the “brick wall syndrome” – when you hit a brick wall because you need to fix something in the actual project. Maybe you made a big mistake and have a mess to pick out, or maybe you’ve counted wrong and the whole design is skewed, or maybe you accidentally snipped your fabric when cutting a thread…. I think that can be the beginning of a unfinished project, but only if you don’t really have the desire to finish it, anyway. Otherwise, regardless of the problem or snag you’ve run into, if you’re really keen to do the project, you’ll usually overcome the problem. If you’re only halfway interested, or less (or not at all), the problem becomes the excuse the quit. I should have read the posts before making one myself, because I have the same issue. One thing I didn’t mention in my (longish) comment was learning. Often I get ahead of myself and get stuck. Frequently I’ll pick up an older set-aside project and realized that in the time it was sitting, I had picked up the knowledge and skills I needed to be able to complete it. (or even just the confidence.) Sounds like that’s maybe what happened with your quilt border. Thank you! Perhaps I just needed permission. I have a couple of very expensive needlepoint projects that I know I’ll never work on again. One being a purse with a pink poodle. I was in mourning over the death of my standard size poodle Sophia and bought and completed half of the purse as a tribute and to ease the mourning process. Thousands of pink silk french knots to complete just the one side. At my age I need to be downsizing and where would I go carrying a pink poodle purse. Thanks, I needed to rant. I’m one of those “great starter, poor finisher” people. So lots gets started, few finished. Then there are the Things That Interrupt Life — a project with a deadline (like a birthday gift), a new baby, the holidays, a good book (or two or three or four), an illness, family and/or work drama — and the WIP turns into a UFO. This is a great post, because nearly all of us have had an UFO in our lives that we felt guilty about not finishing. I firmly believe that our pastimes/hobbies are more of a *journey. * Pleasure and enjoyment and fun are not to be had at just the end (when we finish a project), but throughout the whole process. Last December my group of stitching friends and I came up with the idea of having a Craft Cupboard Clear-out Sale, the proceeds going to charity. This is the ideal solution to the UP problem. It gives us a chance to offload our UPs and pick up a mass of (new to us) odds and ends to enhance our respective stashes. The sale was so successful, we held another in the spring and the third is happening soon. What a freeing article. I feel I could dance on air! I have a quilt project I started 35 years ago…all the squares are done, stitched together by hand, part of the squares were hand quilted, time went by. I took out all the hand quilting and designed an appliqué border. I have 3 of the 12 border edges complete. I will probably finish this quilt and have it machine quilted as I really do like the way it looks and then I don’t have to do it and I can go back to embroidering. Maybe back to creweling, which was my first love before I got side tracked into all the “latest” stitchery happening out in the world. Just think how good I could be at creweling if I had just stuck with it when I started 40 years ago……. I have a few projects in long hiaitus (true UPs have gone to my guilds’ white elephant sales for someone else to enjoy). It took me a long while to figure it out (yeah, Duh!) but each has a problem to be figured out or a realization made as I stitched. Such as while I love the design, will I actually have a table to put it on and use it? Or I’ve gotten this far but I’m not sure what the next step should be. Or I did the pieceing and now I need to design the quilting pattern to complement it. Design decisions often take time and thought for me. Or I’m half-way through the sweater and realize it won’t fit right. Some will get solved (the sweater will be ripped and reknit or not, the quilting design will be thought about, samples made, and then I’ll figure out how I want to mark it onto the fabric for stitching) and some won’t (I really don’t need another table runner). I’ve gotten better at identifying the hold up and getting rid of the UPs so they don’t clutter my piles. And making slow (often very slow) progress on the problem children. I have many UFO’s and I don’t feel guilty and now your acticle Mary has justified my not feeling guilty. I actually don’t nowadays start many projects; I find I’dabble’ with lots of techniques and ‘try’ lots of things so don’t end up with many finished articles. It drives my hubby mad that I produce nothing finished. Sometimes I’m frustrated that I don’t have finished articles but I think I now try so many things that I’m a jack of all trades and master of none. I probably need to specialise more but in what. There is always more bling to catch my eye and lead me astray. Having said that I do enjoy my needlecraft and love trying new teçhniques. Years ago, after collecting a large number of UFOs for all the reasons Mary has listed and maybe a few more, I thought about how much space they were taking up that could be put to better use. Finish them, or get rid of them, I told myself. Would anyone else want to finish my UFOs? Probably not–so if I didn’t, they were going in the trash sooner or later. As I couldn’t bear to trash them, I began working on them. I defined UFOs as projects where I’d cut the fabric, begun the stitching, etc. At first, I tried working on the UFOs exclusively, hoping to power through them and then start on new projects. That only resulted in me doing nothing. After all, I’d set these things aside for a reason…so I wasn’t working on tasty new projects, and I wasn’t finishing the old stashed ones. The list I made of all the UFOs didn’t help; it was ENORMOUS, and daunting. So I came up with my 1-a-month system. Finish one thing a month. I could decide what “one thing” is. For example, if a project was large–my cathedral window quilt, for example–doing some part of the work could count as one. Hemming a skirt could be one. Etc. I could do more than one a month but not less. That left me the rest of the time during every month to work on new ideas–and it whittled away the pile of UFOs. I still have many UFOs to finish, including the cathedral window–but I am not accumulating new ones. The system works well for me, and might for others. I thought I had invented the rotation system, but you made it better,Ruth M! So with your system. you get a minimum of twelve things done. Brilliant! Great idea, Ruth M! Between your idea and Mary’s suggestions, I see the light of hope through the dark forest of UPs. Banish the guilt and free up space (physically and mentally) for new projects. I like it! Thank you, thank you! Mary, you are wonderful to take a complex issue like UFOs/WIPs/UPs and truly examine it! I had to do some “How much do I love this canvas & will I ever really do it?” When we downsized 6 1/2 yrs ago. And I used the “I don’t like the project but technique is interesting and she is a National Treasure” mantra 3 yrs ago w/ANG Seminar class. You are often very prescient about life as a stitcher. Thank you! AND I shared your link to Palestrina Stitch how-to video on a needlepoint Facebook page last evening. Feeling very grateful for you! Great post. I have the added pressure of my husband saying “Are you ever going to finish that embroidery piece that you just had to have?” It did cost a lot you know? What a broken record. Thanks for the article . I have two things that keep my ufos under control..every year I set the same goal: finish two start one….that works for a while. The other is ” ready to go”, patern,fabric, threads maybe. If my tastes change in a year or two , well I break up the kit or recolour it. Three years ago , I updated the colours of a dragon design I’ve had since the seventies and got it done and framed.if I still like it I manage to get it done. My question:what to do with the all the finished projects? Mary, your blog post today is really quite profound and–I think–applicable to all of life. Our paths takes us through eras, stages, false starts, temporary friendships, loves that don’t work out, passion-inspiring collections we lose interest in–each stage, each object, teaches us something valuable and becomes part of what makes us who we are. We shouldn’t feel guilty, for that is the very nature of this beautiful life. You said it more simply, and you nailed it…like you always do. And like I always do, I am thanking you again. This was a timely post for me. Just LAST NIGHT, as I went through my two storage drawers of UFOs (I like the fun of appropriating that already-existing term, even though it’s not technically correct), I stopped suddenly in a moment of mini-epiphany and thought, “Lin, you are not a needlepoint girl.” I pulled out six (yeah…) exquisite canvases–some started and abandoned, some untouched–packaged them individually, and donated them this morning to a local charity shop. Yup, I have a lot of UFOs: things started that didn’t work out as I hoped, things that I’ve lost enthusiasm for, things that got sidelined. I always remind myself that an artist makes a lot of unfinished sketches and makes quite a few pictures that go wrong before they’re done. A fraction turn out good enough to finish and show. Stitchers shouldn’t worry about doing the same; especially if they are making their own designs or learning new techniques. It’s just that our stuff usually takes quite a lot time and effort, and our ‘sketching materials’ can be expensive, so we feel guilty about all the ‘wasted’ time and materials. You are right, Mary, we shouldn’t worry. Embroidery is a process: something you DO. Often a learning process. It is not the thing you’ve made – or, rather, started and never quite finished. I have come back to projects years later and finished them – sometimes. One small tip – when you pack away the materials for projects that you do plan to finish ‘one day’ or you bag up projects for passing on, don’t leave any pins or needles in the actual fabric or touching the threads. Rust marks are really not what you want to find when you come back to your UFOs. Lesson Learned is what struck a cord with me. I’ve taken soooo many classes in various things over the years and can honestly say I’ve learned something I could use in each one. Classes no longer interest me, however, and I have discarded almost every class project just keeping with me the ideas and techniques I liked. I do have a lot of works in progess but no UFOs so am feeling better reading this. If I live long enough, they’ll all get finished someday. What a timely article and thank you for giving us the okay to not finish every project that we had good intentions of starting. It is my promise to myself that I would not start a project without completing the current one. I can keep two going at once because they usually have a deadline. Which means that I am stitching in order to give it as a gift. I keep very little for myself. A good friend told me to not waste time reading a book if I get no pleasure from it even it is heralded as a classic. So, taking this to heart I have put away one particular project-for good. I was excited about it, bought just the right supplies but once I started it I decided that it wasn’t inspiring me. And why waste the time, energy on it if I don’t enjoy it. It causes frustration and keeps me from other enjoyable things that I could be stitching. Because of my declining vision I have a few cross stitch projects that I hope to finish some time after cataract removal. This is a great subject. How freeing. I remember the time I was reading a book that was uninteresting and boring. It occurred to me that I did not have to finish it – I could simply put it aside. As a young adult I wondered where we get this idea that we have to finish everything we start. I meant to also say that I clean my sewing room yearly and do package some of my ufo’s like you mention and donate to local charities. This past spring the lady who was in the shop told me there are many people who love to find this type of thing and they get very excited when they find them! Made me feel even better about getting rid of things I just no longer want to finish. Glad to see there are lots of UFO’s out there not just mine pleased to tell you I am in the progress of finishing a few I have had hanging about for some years. What a feeling of satisfaction when I do finally finish one of them pleased to say I am attending a UFO quilt workshop on Saturday not that I expect to finish my very first quilt but at least I will learn what I need to do to finish the project. Thank you for, your series of newsletters. Oh! Mary, what sensible advice this is. I’m going to share it with the needlework group I belong to. I used to have a large number of UP’s (love that name) they were all tossed. A couple months ago I found one I had forgotten about, a T-shirt on which I was embroidering a basketball for a relative. I did not want to toss it, but what was the point, I never would finish it, and he was already 2 sizes larger ,so I tossed it. I have felt guilty over it so this article was perfect! Thanks! LOVED your article and advice! I have double digit projects, sometimes you want something small to carry to a doctor’s office. Sometime you take a class and have a larger more complicated piece. I take pride in finishing pieces. And I do occasionally lose interest in one. Our guild has a rummage sale once a year. I can always donate it there. I don’t have many UFOs – pieces that are actually started but not finished. A couple, I guess, but I’ll get around to them sometime (or so I keep telling myself). What I DO have is SABLE (Stash Acquired Beyond Life Expectancy): kits, fabric, threads, and patterns that I’ll never actually start, much less finish. My solution is to go through them every year or so, cull those that no longer interest me even vaguely, and take them to my EGA Chapter’s annual Stash Reallocation Sale. That way someone else can make use of them at a bargain price and our chapter earns a little money. SABLE! I love it, Mary in MN (my home state)!! Now I have a better name for my stash, which consists mostly of patterns! I do have great longevity on both sides of my family, but having just celebrated my 68th birthday, I’m wondering how many of the USOs (Un-STARTED Objects) I will really be able to do. I don’t think I have any that I don’t want to do, and it’s hard to prioritize which ones I like best, but I know I must, as I can’t expect my eyes and my fingers not to age. One strategy I’ve employed on cross-stitch projects is to do them one-over-one (which saves thread and wall space) or to do them as petitpoint on 40-ct silk gauze, so they’re done in half the time. Doesn’t work for any other embroidery, however. This column was a gem, Mary C in Kansas, as are you. Keep up the terrific work you’re doing! I find it so interesting that it seems all crafters/sewers seem to collect unfinished projects. I too am guilty. I decided to call myself a collector and warn my kids that one day they will have to have one awesome yard sale. PhD – I’m learning so much! I have UFOs from EGA programs and classes. But I have taken on 3 UFOs that family UFOs. 2 from Grandmom and 1 from Mom. All finished. One is framed and hung, one is a table cloth awaiting company, and the other is done but unframed. I think they are labors of love! I too inherited unfinished table-clothes etc from an over-worked VAD nurse during the WW2 (Mum and a Grandma). 3 I completed and use, one awaits my grand-daughter who is becoming very good at running and tent stitch. If she masters daisy stitch it’s hers. Oh Mary, this should be required reading for stitchers!! While I certainly know all of these things, seeing them summarized really helps and gives me permission to let go. Thank you, thank you. I am saving this article to refer to often! Love your UFO commentary – you articulated so clearly ALL of the things I have felt at times. It’s great to know I have valid ideas about UFOs and they are pretty well the same as other stitchers. I have many UFOs of differen types. The needlepoint that I have trouble seeing even with my reading glasses. The cross stitch I started for my sister but sadly she passed away before I could finish it. I have given away a lot of kits and finished items I no longer had a place for. Your column was great and made me feel better about my UFOs and WIPs. My reason for my latest UP was that I had finally overworked it sufficiently that I couldn’t even put a very sharp needle through the stitched areas. I decided to do a project that was mostly cross stitch (an 11 3/8 by 14 3/4″ project on 32-count linen, stitched over one thread, and all filled in). There was one large non-cross stitch area (like the reversible blackwork area, reversible just for the challenge; took a lot of time). The picture area was supposed to represent my first sail with my husband, so it was special to me. I decided to do the most boring and redundant areas first because I thought I might not have the heart for finishing it if I left them for last. Bad decision. Spent about one year on this thing (no, not 24 hours a day every day, but a lot of hours). Got down to the last area and discovered it really didn’t work. The sky looked great (a soft & gentle sunset). The water looked boring. Decided metallic thread on top of the already tightly stitched area might work to add sparkle. Oops, didn’t look good, but now no way to take it out without ruining all the little stitches underneath (I had woven it in and out, like waves). Oh, and now the land mass and sailboat look like they’re receding/indented. Perhaps one more layer of tiny stitches on top will make them look better, thicker. No, that didn’t work, but now I can’t get those stitches out either. And I don’t like the colors. Maybe one more layer would do it. Is anyone out there laughing yet? This is my design, so all the problems are my fault. I gave up, accepted reality. The design didn’t work. Out it goes. Took me a few days to decide what to do next. I had another design set aside, so decided to be smart this time and try just a little portion of it (the beetle). Hmmm. Doesn’t look good at this scale (too small). Better work it over two threads. And what would this do to the full project — blackwork bees, beetles, and dragonflies? The design area would then become 30 inches by 30 inches. (You must be laughing now.) End of story. I will work on a new design, testing everything all along the way. I learned. And, best of all, I decided to set aside my aversion to doing someone else’s design. I ordered a Jane Nicholas stumpwork project, the easiest one I could find (always wanted to learn this technique). Hopefully that project will give me something fun and challenging to do while I poke around, working at a new design. Or maybe I’ll just buy more kits and stop fretting about being original. At least I’m laughing at this point. And I never want to work another cross stitch. I call these projects PHDs – projects half done. If I have fallen out of love with the project and no-one else wants to take it on I then re-evaluate the work already done and cut pieces out of it to applique onto another project, maybe a book cover, or bookmark, or incorporate into something bigger. I so agree with all that you say (they are also UNSTARTED Projects). I’ve been hoping (and tried and failed once before) to start up a UFOs craft club at church as I have a feeling that when you have a ‘class’ to go to, you can get on with these things, except you need some experienced people there to help you along when you get stuck. I’ve put projects aside when I’ve had problems and after, say three times I find it hard to start yet again. At the moment I have rather a lot of UPs, that still interest me so I would not want to get rid of them. There’s other stuff, old study material that I need to ditch to make room both physically and mentally for sewing projects. I wonder why I won’t? Oh yes, I saw some deliberately unfinished projects at the Royal School of Needlework, where students had all been given a particular design and worked on it, but left it unfinished to show the work involved. These were framed and on display. That seems a good example to me. I don’t feel enthusiastic about cross stitch although I’ve seen some beautiful work done that has surprised me and to challenge my prejudice I’ve bought myself a child’s beginner cross stitch kit. Really all the freestyle embroidery interests me most but I’m not very good at it and have little time to tackle building my skills. I also knitted myself a hat a couple of years back and now quite like knitting, frankly dismayed to find these things can’t easily be done in front of the TV as they need more of my focus of attention than I thought they would. Embroidery, ok, but KNITTING!! Crochet doesn’t really interest me as I don’t really like the pictures I’ve seen of completed crochet work. The idea of packaging up a project that you are no longer interested in is to donate as unfinished is excellent. My mum recently turned a bag I had been planning to make into lovely little shorts for my 4 yo daughter. I stitched some flowers on denim to make a bag but as that was a decade ago, it was clear that I was never going to finish it. My mum just positioned the pattern pieces to include as many of the flowers I had stitched (in a lovely over dyed thread!). Now my daughter can enjoy the fruits of my labour – at least for the next 6 months until she outgrows them. What a great idea Jaime! I bet your daughter looks adorable! Thank you for this “freeing article”. Moving has caused more disruptions in my needle arts projects than anything else. This is an absolutely wonderful article and I agree wholeheartedly with everything you have said. Thank you so very much. Thank you, thank you, thank you. I now have a reply for those who comment on the number of UFO I have hanging around. I can now say. I have learned the technique and I am moving on. I am very blessed with a long time friend who is now passing me her UFOs to me. We have a 40ish year gap between us, and as her eyes aren’t what they used to be & her main interests are along the patch work line now rather than embroidery, so I am getting the interesting & often challenging opportunity to finish her UFOs. One I have done was a goldwork head – this was a gift for her daughter (also my hairdresser) & my reward, other than the pleasure of stitching & the appreciation of these two ladies was being the recipient of all her goldwork supplies & books. At the moment I am finishing a piece of whitework – I’ve done what I can so far, but there is no pattern & need to do some research to see what would suit the style of what has been completed so far. Dear Mary, you are plenty of truht. I have a specially on purpose bag for all my UPs. And you know what? Many times I have return to that bag to look at them, and most of the times… I complet one project. I don´t look at them as “a waste of …(time, money, etc)” And thats is because I allways embroider or sew what feels in that moment, and if its ends unfinished, the time to finished it will come!!! I love my “hobbies stuff” and its happy to me to know that I can see it every time I want!!!! Excuse my English please, but I don´t like Google translator!! Best wishes, Paula. I can’t count (because it would be depressing!) the number of start-i-tis projects I have rid myself of over the years. The biggest one was a full-sized Celtic Knot quilt that I wanted to make quite desperately at the time. I still want that quilt. Unfortunately I don’t want it in THOSE colours. I made the mistake of listening to the advice of an ‘expert’ at the fabric shop and bought colours that I ended up hating. The project sat in my closet for several years, guilting me out every single time I came across it. There was a lot of money in that quilt. I spent hours completing the few blocks I did. I finally came to the realization that I was never going to finish that thing and parceled it up and chucked it into the next yard sale we had. More guilt. But – the relief I felt when that thing was gone was incredible! UFO’s . . .I’ve got many. In fact a friend (who apparently always finishes her projects) once told me that I had more unfinished projects than most people complete in a lifetime. To which I responded I’ve also already completed more projects than most people do in a lifetime. From time to time I sort the projects into: never started, started and in process, and finished stitching but not finished (framed, mounted, made into a pillow etc.). The quilt projects are a whole ‘nother story. Sometimes it just seems that the new project is going to be so much more interesting and beautiful than the one currently in process. I actually keep an eye out for interesting projects that have found their way into thrift shops and have finished a table cloth (that looked like at least 2 other stitchers had worked on it,) a couple of crewel pillows, and a cross stitch sampler from thrift shop finds. I have a number of pieces in progress. Several of them are projects from my EGA chapter that I have not had a chance to finish. (I did finish one this past September from several years ago.) The remainder of projects are personal ones of several years wait to be completed. Time is my biggest problem. I have Thursday nights from 11:30 pm to around 2 am set aside to do needlework and sometimes life interferes with that. Another problem I have is deciding which project to work on. This combined with the first problem and the fact that I have regular clothing repair sewing to do has me often not doing anything as I cannot make a decision. I recently decided that I will work on one particular project until it is finished. I will alternate weeks between embroidery and household sewing so I do not have to feel guilty that the socks are not being mended or the pants shortened and will not have to decide which project to work on. I wanted to mention avoiding other’s UFOs. When I was young my mom started a bedspread quilt for my younger sister. It was an extensive amount of handwork applique. She worked on it at the beach in the summer telling the other ladies “You will have sunburned tongues, I will have this finished.” for several years. Around 10 or 15 years ago she tried to palm it off on me to finish as she had come across it. My sister had was in her 40’s and had a daughter older than she was when mom started it. I graduated in 1984 and I have to thank you for making me laugh till I cried. Unfortunately now I’m crying because I can’t get “I’m all out of love” out of my head so thanks for that too I guess! Isn’t it amazing that after 30 years we can still remember ALL the words? I used to have UP’s all over the place. Then I took a 15 year break from crafting/sewing/quilting/embroidering. I invited my mom, my sister and my crafty friends over, made a lunch and let everyone pick through everything I had. Anything that was left I donated. I started crafting again about 5 years ago and I’m glad I got rid of it all because my tastes have really changed. I can’t think of any unfinished projects right now. I hope I can keep that up … I have about 4 projects going now as well as Christmas. Love this reminder Mary! It’s a great perspective and I already feel less guilty and more motivated just by reading it! On another note, I know of a quilt store that had an annual UFO swap event. Everyone would bring in their UFOs and swap for one that caught their interest. My mom picked up nine pre-printed embroidery panels, two of which were completed. She is now almost finished with a beautiful quilt that features a hand embroidered top. Nice to know something good can come of those UFO’s! After all, one woman’s trash is another’s treasure! Wonderful – amusing, and downright sensible. My oldest UFOs? Both would be about 100 – a needle-lace doily from my maternal grandmother, and a mountmellick mantle cloth from my paternal grandmother. I’m not quite that bad – yet, and I do try to hand on things I know I won’t finish. I don’t have any UFO’s because I refer to any unfinished embroidery projects as PhD’s. Projects half Done. Or in my case ALL came to a stop when i got cancer. First the meds were so strong i was drugged for 6 month so no work could be done. The surgery that cost me half a lung was so extensive that even moving my arm was impossible. Amazing as it is i started again slow… Stitch by stitch i was able to finish my project ! I must say the finished product was worth every bit of pain and the return use of my arm/ hand is priceless. The plus side is that my DR. Is now letting her other patient s know there is another option to regain use with results ( beautiful ) other then normal old fasion therapy. I am told tha even males picking projects ! Thank you for the post and know that you do inspire people. Ruth, I am pulling for you! And glad that something you love could help you heal! My Dad used to call them Unfinished Symphonies which sounded much better and I don’t think your work should become a chore. Enjoying what you are doing is the most important thing. OMG, I have a bunch of these! Not so many as I once had since I did make myself finish one or two. Now that I’m moving forward to where cross stitch is one type of embroidery I enjoy doing, I can’t see myself going back to them. BTW, Mary, I just wanted to tell you that one of the pairs of scissors I ordered from Ernest Wright and Sons arrived today, the “Large Bow” straight embroidery scissors. I can’t do anything right now due to my hand surgery but I’m looking forward to using them in the new year. THANK YOU Mary! Wonderful advice and what a load off my shoulders! Thanks for the idea to find someone else who would really enjoy finishing projects…and so focusing guilt-free on projects one does enjoy! Over the years, I accumulated a number of UFO’s (and I will continue to call them UFO’s – sorry, Mary). I got tired of looking at them and did triage on them. They got sorted into 3 stacks – those that I might finish someday – those that didn’t stand that proverbial chance in … – and those that I wasn’t sure which way they fall. I found a girl scout troop looking for embroidery projects and made a gift of the proverbial chance items. I started putting the ones I might finish into my stitch basked. Occasionally I would take one out to work on it. Eventually I decided that all of them belong in my giveaway pile. The girl scout troop didn’t need any more, so my local Salvation Army got a nice stack of partially done projects. Anyone want to guess how many UFO’s I have right now? It’s not a small number. Mary I prefer to call my work not yet completed my PHD’s (projects half done). If my taste for a project changes in progress I donate the workings and pattern to local charity hopefully someone else will love it enough to finish. Great Essay!! I have one project that I stopped working on when I decided to get a new house in 2004. I’ve worked on it once or twice since then. All that’s left to do are a few dozen French knots. The problem is I don’t need it anymore. The old house had 23″ between the mantle and the sloping ceiling. In this house I have about 6′ between the mantel and the cathedral ceiling. Where can I hang this short, but long, picture, and the 3 others I made to fit that space? Like most of my UPs, it will get finished and lay in the “to be framed” box. Very interesting post. You put things into perspective in an excellent way. Oh they are there alright. The unfinished projects. Surprisingly I’ve picked up a few more, some started, some not, that I’ve picked up at yard sales or such. Sometimes it’s just supplies. Suddenly I realized I have to stop the collecting and start the working. For the first time I have a deadline project. A wedding cross stitch sampler worked in metallic thread and size 11 seed beads. As you might imagine this is a struggle because of the materials. Its ruining needles and the floss is difficult to work with. Sometimes the beads break. Each bead has to be rubber gripped into place. Its perilously close to becoming a UFO. But it is my own design pieced from free patterns of four different sources, so I want to see it done. So I will finish it and do my best to not put anything on an actual deadline again. That WOULD be best, LOL. The one thing I love in your communication is that while you add so much value to my skills and interests, you make me feel that I am not the only one….. All the points that you talk about like the UFO or the slow progress , or the mess that we create in our workroom or the change of mind while progress… you make me feel quite normal. I do realize while going through all your notes, that we embroiders (in whichever skill level we are in) are all the same. Thank you so much for all these writings which actually adds to my craze about handwork, esp embroidery. To be honest, I have no UFOs in embroidery… but i do have in other projects like crochet, tatting, etc., I love embroidery and i see that i take up no-so-big projects and finish it in one go, even if it is delayed. Please keep up the good work. You make me feel so fine. This makes more sense than any article I’ve ever read about UFOs. Thanks for your wisdom! Brilliantly well said! I am a beginner to embroidery; I am trying lots of techniques and still haven’t really found what I like. I have a couple of unfinished small embroideries but I learned a lot by stitching them and the threads can be used for another project so I don’t feel guilty about having them partially completed. I have stuck then into a project book along with my notes. OH YES!! So will you please reset this blog so I can print it out for my Husband… The worst UP is the 18inch (started that long ago)rectangle of pink rosebuds- started whilst waiting for my son to arrive. Note the word Son. I now have a granddaughter and looked out the ring of rosebuds for a pram cover. Only Mum doesn’t use a pram! The Stint. Whenever my grandmother, an avid needleworker, had a project that she was less than excited about, but that needed to be done, she would do her Stint: 1 hour of work on the project every day. Then she rewarded herself by working on whatever project she wanted to do. I still use that technique to keep myself working on projects that are maybe less compelling, but still important for one reason or another. Sometimes the Stint is a chore, but more often it’s all I need to get over whatever was preventing me from moving forward on the project. Now if I only had more hours in a day!! As a friend of mine said many times “….After all, folks, it’s only a hobby!” In other words, it’s important — but let’s get a sense of perspective. Thanks for the sense of perspective! Thank you for a great article! I have a few boxes of UFOs. I was a keen stitcher before I had kids and then… no time and sharp objects and shiny threads around little fingers were not a good idea! But now that the boys are older I am slowly getting back into my needlework. I know from experience that a lot of my “process” is the thinking/dreaming/planning but I’m not going to execute all those plans. I just had a dream about a UFO that I put away many years ago because I was stalled on what to do next. So that will be coming out again soon! Love hearing about everyone’s experiences. I can add one more reason for not completing or getting on with projects, and that is that you don’t feel your skills are yet up to the standard hoped for, for the project. This sounds as if I’m being perfectionist, but I’m not, my stitching is not neat at all and I have these beautiful kits to tackle by an unpractised embroiderer. After that, all the other reasons are all appropriate for further procrastination. My husband refers to them as MIPs, Masterpiece In Progress, instead of UFOs/WIPs. He’s so smart!! I have quite a few unfinished projects, cross stitch, sewing, quilting, even digital projects of writing and websites that need some more work. Sometimes you just have to go with what speaks to you in the moment. I agree, having unfinished projects is okay, perfectly normal even. We grow and change, our life and circumstances may be different, all sorts of things can happen in the course of a project. You can stash it away for awhile and maybe come back to it, but it can be a wonderful gift to pass on to someone else if you decide you’re never going to get back to that particular project in the pile. LOL, Mary! How wonderfully creative of you to tell us why we don’t always finish things. Just a short story to tell here. When I was pregnant with my first child i started a stamped embroidery piece. The child was born in 1972 and Mom no longer had time or energy to embroider. Many many years later said child was in college and while she was rooting around in the drawer of an old dresser came across my UFO. She said oh mom this is so cute. who were you making it for? rather shamefacedly i admitted i had started it for her while she was cooking. she went all gooey eyed and asked me if i’d finish it for her. i said ok and took it from her hands. After moving it from one place to another for another couple years i took a good look at it and realized i only had five little words left to embroider. I did finish it, mounted it and sent it to her in nashville. she had completed college and moved away but was working in a photo shop that also did framing. i don’t remember if she framed it or not so i’ll have to ask her. I guess the moral of the story is that sometimes UFO’s can sit around for a LOOOOOONG time and finally get finished….lol. i just sent her an email asking if it was still a UFO? Thank you so much for this in depth discussion on the topic of UFO’s!! We actually have an ongoing project each year in our EGA (Monguagon – GLR) guild called the UFO Challenge. We pay the guild $10 in an envelope and pick an unfinished project to be completed and displayed at our December luncheon. If we finish the project, we get a charm to go on a guild stitching bracelet – if we do not, the $10 goes into the treasury. It sure keeps one focused at least on one unfinished project a year!! I am part of a Thursday afternoon stitching group and we do get unfinished projects from donors. Most times there is someone who takes it on to finish and if not, the teacher takes it to her next group to see if anyone would like it. The same applies to left-over threads; families from people no longer able to stitch often donate the threads no longer wanted. I have given strict instructions to my family to donate the threads to my local Arts Centre so that someone may get use out of it. My Sister recently send me, from Holland to Australia, a whole bag of DMC thread her mother in law, now 93, can no longer use. It was well received and we passed them on for a small donation to an African Aids fund. Naturally one needs to test the threads to see if they are not too old and fragile to be used. Also, I wanted to say that I’ve found a new use for at least one of my UFOs, one that the pattern is uniquely suited for. I’m a self-taught cross-stitcher that’s recently become enamored of stumpwork. I haven’t had a lot of practice with all those different stitch types, but I was really disliking practicing ‘in the wild’, so to speak, on ground fabric with no real picture to make. And the typical patterns shown for stumpwork kits kind of freak me out – a lot less instructional signals than I’m used to as a cross-stitcher. Then I ran across an old UFO stamped cross-stitch kit of a bald eagle and American flag, and when I examined it found out that I’d screwed up on the colors in the eagle. I realized I had the perfect opportunity, and right now I’m using this UFO to practice various stitches on, filling in the spots outlined on the fabric. I expect a really funky looking eagle when I’m done, but it’ll be a good learning experience, and will ‘finish’ the UFO. Also wanted to say – thanks for the blog! I’ve got a couple of books on the basic stumpwork stitches, but when I run into trouble understanding how they’re formed, your blog is one of the first I check out. Excellent article!! I love the positive approach to it. Plus, really, all hand work is an unfinished project. You really cannot finish handwork in a 2 hour stretch, or 20 minutes. They take much longer than that, so therefore all are going to be unfinished. I love your column. Thank you. I am so glad you posted this! 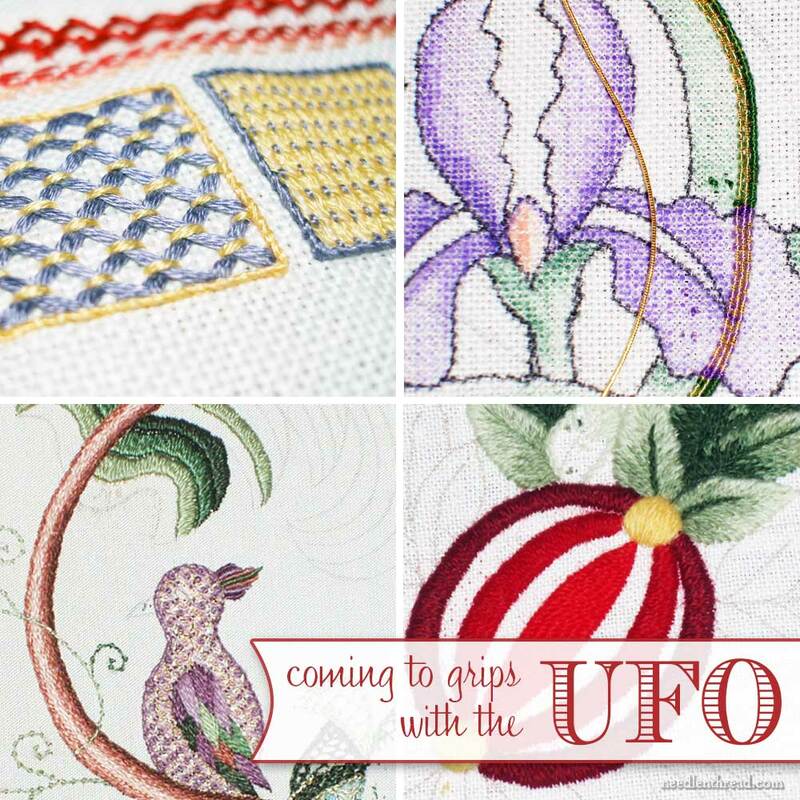 My embroidery guild here in Victoria, BC, Canada, is planning an actual UFO-Fest this coming spring, where we can celebrate the projects we’ve started but…. taken breaks on…. for a variety of reasons…. There’s a lot of fun to be had in UFO’s, and in sharing their existence with others! What a great post – and I love all the extra acronyms too. Watch out for UFOs and investigating PHDs in Area 51 🙂 I totally agree that UPs should not be a source of guilt but a few years ago I took a slightly different approach. I undertook a “Year of Finishing” – no new projects or supplies for 12 months until I had emptied my cupboards of some of those pesky unfinished items. It was an utterly liberating experience because I learnt so much by concentrating on just finishing projects. If you want to read more about it, you can find the full story on my blog http://beautifulstitches.com.au/a-year-of-finishing/. I have around 12 ufos, iam forcing myself to finish atleast half of them.I don’t know why I most of time lose motivation midway.It’s extremely hurtful. You’ve been spying on me I’m sure. The day before you posted UFO information I had been searching for something in my workroom (As we do). I peeped into a small project storage box and the contents did that looking at me thing so I had a closer look. No, I was really not sure how I had intended to use these little bits and bobs except that they were to make a journal cover for my daughter’s birthday two years ago. The lid was closed but the contents continued to stare at me. Then your post arrived in my mail-box. It really doesn’t matter what I had intended to do, I have moved on. Out came the box. A fresh approach, some stash adding and taking away and I have a project that I will really enjoy working on that I just know my daughter will love. Thank you Mary, it’s great when that happens. At the beginning of this year, I committed myself to finishing all of the UFOs I had. I started out with an unflinching purge and then a count, so I knew exactly what I had to finish and if I needed any supplies. Then I kitted them up and got to work. I’ve finished three quilts, two smocked dresses and an embroidered jacket this year. I’m on to my last UFO quilt top, and near the end of two smocking projects. I can’t tell you how good it feels to know I’ll be starting the new year off on a clean slate! I just loved this article! I enjoyed reading everyone’s reasons for UFOs. Like all of you I too have many UFOs. But I particularly like the term WISP – ‘Works in Stasis Project’ for very select projects I have. The reason I call them ‘works in stasis projects’ is because I only work on them under certain circumstances or conditions and when those conditions or circumstances change then the work on the projects halt and they go into stasis until needed again. For instances, I have one needlepoint project I started when my husband was in intensive care after a heart attack at the ripe young age of 41 yrs old. Once he was safe and at home I stopped work on the project. Over the next 20 years my husband had 12 angiograms and 11 angioplasties. Each time I was in the hospital out would come that needlepoint project until he was safe and sound at home. A couple of years ago he a quad bypass and that was the last time I worked on it. I hope to never work on it again. But should I need it, out it will come. I have another WISP I worked on when I was recovering from surgery. The beginning of October my husband was diagnosed with an aggressive form of prostate cancer. I have started a new WISP that I hope will go back into stasis after he has his Da Vinci Robotic surgery in December. But you get my drift. Some of these WISPs I know I will never finish and others I hope I will never finish. However, those UFOs up in my craft room be patient – someday your turn will come, just as soon as life gets out of my way. What a refreshing article! I feel so guilty about UP’s but I like to have more than one project on the go at a time. One reason you didn’t mention is that there’s nothing you can do with it once it’s finished so completing it becomes a bit pointless. Great article! I am now almost 62 and have learned to control myself on the internet with finding new projects but I have also learned that I have to spend my time on projects I enjoy. Work needs to be finished but hobbies need to be enjoyed. I love doing Christmas projects so that is what my family receives for Christmas. Probably have overdone but I like it. You are so right! I very much appreciate and agree with your thoughts on UOs. Thank you for a wise and practical post. I have a reason to add to why I stitch, embroidery, quilt, etc. I believe it is a large part of my heritage. I do it to fill time, too. But sewing, quilting and needle-arts was a large part of my (female) ancestor’s lives. I have too many UP’s and WISP’s, but I do have a way I finished many of them. I would start projects during football season, while sitting with my husband as he watched Monday night football, or Saturday or any sport. They are never ending. I would accumulate half finished projects. My new year’s resolution would be to finish projects instead of starting new ones. I finished quite a few this way. And a fabulous article. Loved it! Great idea, Pamd. Perhaps I’ll do the same with the remainder of this football season. Thanks for the idea! Pam, about 15 years ago, my daughter and her friends took an interest in Nascar racing for about 2 minutes, and then moved on–kids! I, however, found it t0 be 4 or more hours of stitching, and now I’m still a “fan.” See, all the cars just run around in circles. The only interesting parts are the crashes, and they show them repeatedly. Then back to stitching, waiting for another crash.The more crashes, the longer the race/stitching time. This is a secret, please don’t tell my friends! I have an unfinished crewel project BUT I want someone to finish for me because I want the finished project to frame. Anyone interested in finishing and returning? I will pay for the service. It is a 16×20 forest scene.